Calculators: How can a machine instantly compute the square root of 764? Digital cameras: Are they really better than old-style film cameras? Camcorders: How do we store moving images as a series of still pictures? Carbon monoxide detectors: How can you spot leaks of toxic gas from fuel-burning appliances? CCDs: How does the charge-coupled device in a camera or scanner turn a photo into numbers? CDs and DVDs: How can we store and playback sound and data with laser beams? Why are recordable CDs different from rewritable ones? Digital pens: Can your pen instantly beam the words you write to your computer? Digital radio: How does digital radio cut out static and interference? 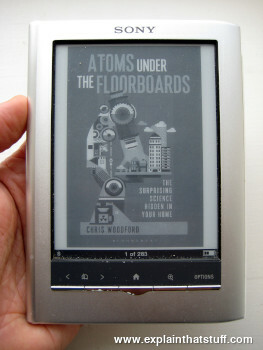 Electronic books (e-books): Why are people suddenly embracing electronic books? Electric guitars: How does an electric guitar differ from an acoustic one? Flash memory: How do flash memory cards remember things even when the power is off? Flatscreen (LCD) television: How do tiny crystals make the picture on your laptop or cellphone? GPS satellite navigation: How can satellites tell you where you are? HDTV (high-definition television): Why are HDTV pictures better quality than ordinary ones? Metal detectors: How can you find buried treasure or check suspicious people for weapons? MP3 players: Why does an MP3 player never really sound as good as a CD player? Night vision goggles: How can a camera see when there's no light around? Pedometers: How can you count the steps you walk with a swinging pendulum? Plasma television: Is a plasma TV picture really just a load of hot gas? Projection television: How can you beam a TV picture onto your wall? Noise-cancelling headphones: What's the best way to listen to music in a noisy place? Quartz clocks and watches: How does your watch keep time? Synthesizers: How can electronic keyboards make sounds like a barking dog or a creaking door? Yo-yos: Why do you have to keep tugging on a yo-yo string to keep it going?